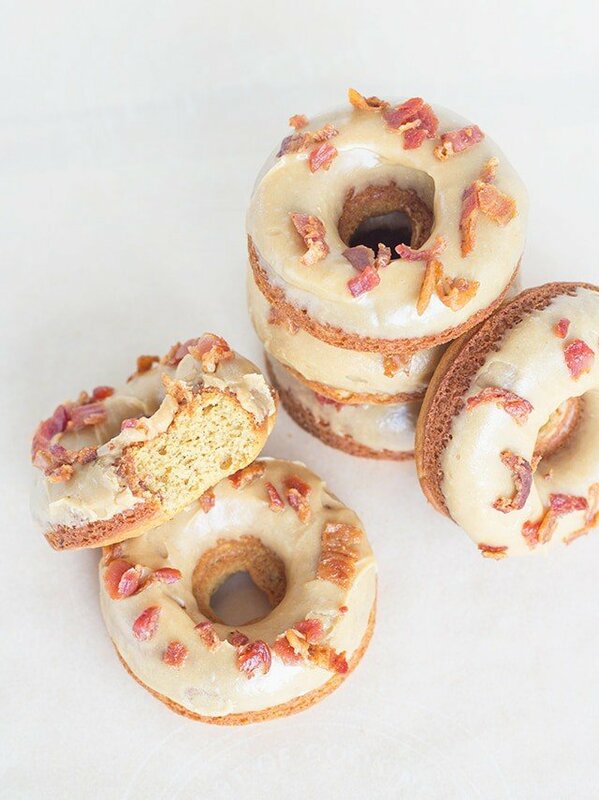 Perfectly baked donuts loaded with peanut butter, bits of bacon, and a hint of maple. It’s not a huge amount, just enough to provide another flavor of bacon. You can definitely use shortening instead. Be warned, it won’t have the same flavor. The drippings gave a slight meaty and smokey flavor. It’s not over-powering at all, just another depth of flavor in the baked donut. 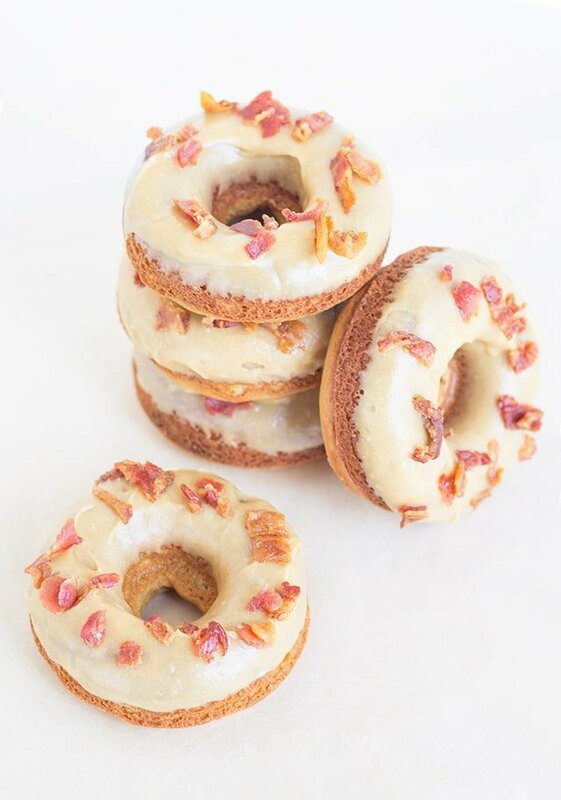 These donuts are the perfect cakey donuts. They are incredible dipped in a hot cup of coffee. I’ve said it a thousand times, I’m a dunker. I’ll dunk anything. 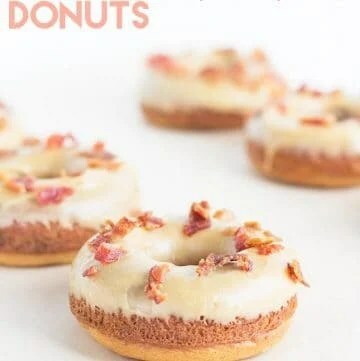 The maple peanut butter glaze keeps the donuts soft and adds a way to keep all those bits of bacon on the top of your donuts. The glaze also crusts so there won’t be a huge mess after it sets up. That always makes it awesome for storing. That is, if you have any left to store. First you'll need to get your bacon cooked and to reserve your bacon grease. This is how I do it. Preheat oven to 375 degrees. Place a cooling rack inside a jelly roll pan. Line your strips of bacon side-by-side. If you run out of room, add the extras on the layers of bacon already down. Check on it periodically. As the bacon shrinks, there will be more room for the extra pieces. After about 25 minutes, flip the bacon over. Let bake fro another 10 minutes. Check to make sure it's done to your preference before you remove it from the oven. I like mine more chewy than crispy. Place on a plate lined with paper towels to cool. Pour the bacon drippings into a heat proof bowl to cool. Preheat oven to 350 degrees. Spray a donut pan with non-stick cooking spray. In a mixing bowl, add in the bacon grease/drippings and peanut butter. Mix on medium until incorporated. Add in the granulated and brown sugar. Mix on high until light and fluffy about 2 minutes. Add in the maple extract, vanilla beat paste or extract if you don't have paste on hand, sour cream, eggs and milk. Mix on low until incorporated. Add in the baking powder, baking soda, salt and flour and mix on low until the flour is almost incorporated and it's safe to turn it on high. Turn on high for a few seconds to incorporate the rest of the flour. Stir in the bacon with a spatula. Place the batter in a large freezer bag. Press out all the air and seal the bag. Cut the corner out of the bottom of one side. Pipe in one layer of batter into the prepared donut pan. Add any batter to spots that don't have an even amount. Place in the oven and bake for 13 minutes or until done. The sides will be golden brown. Remove from the pan. Spray the pan before adding batter each time to prevent sticking. Repeat with the rest of the batter. Let the donuts cool completely. In a microwave-safe bowl, melt the peanut butter for about 50 seconds. Add in the maple extract, milk and powdered sugar. Whisk until the glaze is completely smooth. Dip the bottoms of the donuts which will now be the tops in the glaze. Sprinkle on the crumbled pieces of bacon and set aside to dry. Repeat with all donuts. Curious as to what donut pan I used? Here you go! Bloggers, do you want to join in on the peanut butter bash fun? If so, email me at [email protected] and request to join the Peanut Butter Bash facebook group! The first Thursday of each month we post a dessert/sweet with peanut butter and a mystery ingredient. This month’s ingredients were peanut butter and bacon. 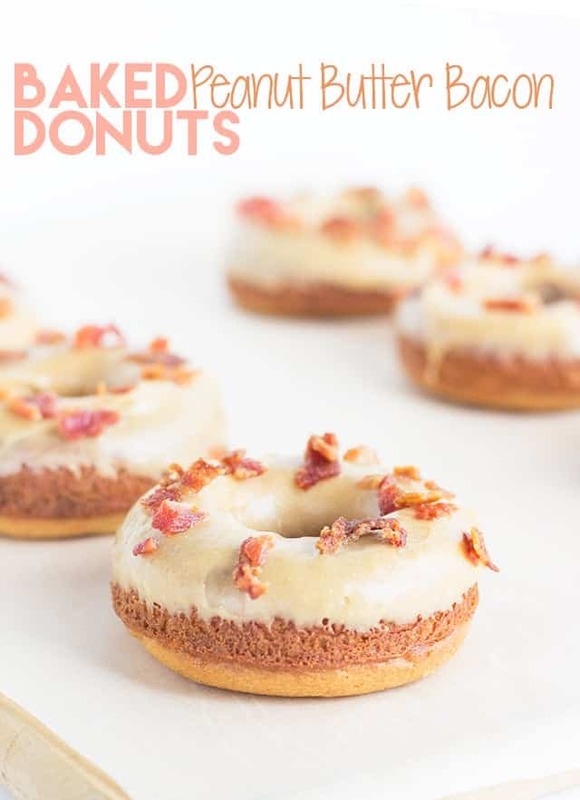 Here are the other peanut butter and bacon creations! Shut the front door!! These look incredibly insane. Elvis is rolling over in his grave right now and I am drooling. Haha! Thank you so much, Kristen! Hello Miranda! Looks like you hit the Lottery with this one! 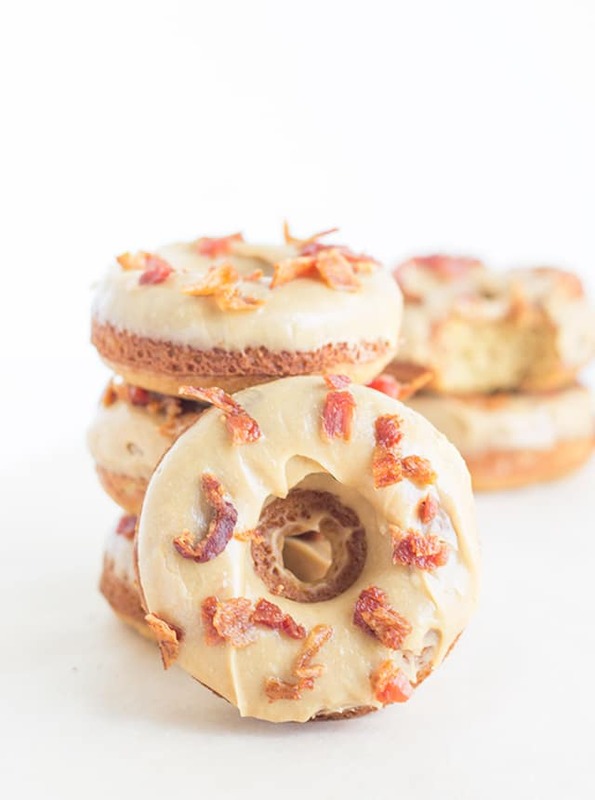 PEANUT BUTTER BACON DOUGHNUTS BAKED!!! I am all for Peanut Butter! Bacon! Doughnuts! AND WHOA! BAKED! I am going to gather all my courage and make these! Stay tuned!! Hi Sherry Ann! Thank you so much! I’m super excited that you are so pumped up about the recipe. Let me know how they turn out for you! Sounds amazing! I love that these are baked and not fried! Yum!! Loving the combination! Visiting from Two Cup Tuesday. Thanks for sharing.